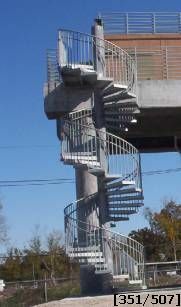 A spiral stair project in New Orleans after Hurricane Katrina. This is a Pump Safe House in need of reconstruction. It was showing it’s age after this disaster. As part of the reconstruction effort, engineers designed new safe houses that were capable of withstanding 250 mph winds and storm surges over 20'. Stairways, Inc. supplied 17 spiral stairs for this project under strict structural guidelines. All of the staircases are 8’ in diameter and the heights range from 21’ to 27’ floor-to-floor. Made of steel and galvanized, these stairs shipped in one section each, and they are designed to meet the International Building Code as a means of egress. Let us work with you in designing and fabricating your next spiral stair project.